At the end of the first season of EPIX’s Berlin Station, the identity of the whistleblower, “Thomas Shaw,” was revealed and the station was left in chaos. Season 2 picks up several months after those events, as the station tries to return to order under the new leadership of BB Yates (Ashley Judd). But there is a deadly cloud hanging over Berlin with the approach of new elections and a far right contingency determined to make its mark – by whatever means. 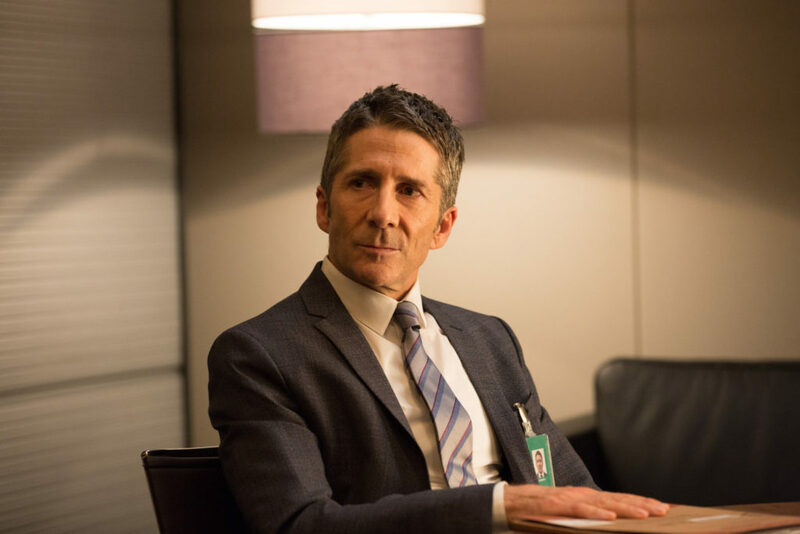 OHSOGRAY talked with Leland Orser, who returns as Robert Kirsch, the deputy station chief, about how the changes to the cast affected the new season and what fans can look forward to. Berlin Station season 2 premieres tonight, October 15th, at 9/8c on EPIX. The first two episodes are also available for screening on EPIX’s Berlin Station page and on SlingTV. At the beginning of the season Ashely Judd joins Berlin Station as BB Yates, the head of the station, how does Kirsch feel about this? He’s suspicious, as any good CIA employee would be. He’s not all in. He waits to pass judgment and I think he soon realizes that there’s a hell of a lot to respect there. She has big shoes to fill. Richard Jenkins was the chief last season and those are are huge shoes to fill as a character and as an actor. She came in like a powerful force and she’s such an accomplished and fantastic actor – fully and totally prepared, knew exactly what she wanted from the part – and yet was extremely deferential and respectful of all of us who had already been there for a year. Now Kirsch mentions early in the first episode that they’re going “rogue” a little bit. Is she going to usher in this change of direction for the station? Two things: her character is referred to as the “station whisperer.” She’s someone who comes in and mends damaged morale and damaged stations. The CIA in and of itself, at its inception, was a rogue operation and has in many ways encouraged that of the people who work for it. I think any good employee, any good operative, any good agent of the CIA has to be prepared to go rogue at any point in time. In a world of secrets and lies, truths and half-truths, you have to be able determine who’s good, who’s bad, who’s shooting you straight, and who’s coming to stab you in the back. There’s also a new addition with the American Ambassador. Kirsch kind of butts heads with him early on. Does that tension continue throughout the season? That’s an understatement. Right from the get-go, he’s on to this guy. He sees that he has an agenda and no way in hell is he going to shut his mouth about it. My character, Robert Kirsch, is passionate, unfiltered person, married to his job, obsessed with/sleepless over everything and everybody that he comes into contact with. Ambassador Hanes is right in his sights from the get-go. Kirsch is also kind of a salty character. Are you having fun playing him? The part jumped off the page for me from day one of last season. He speaks his mind. He speaks his heart. He is a perfectionist. He settles for nothing less than 110% from everybody that he works for, that he works with, that works for him. That being said, he doesn’t have a lot of friends and his personal life is a shambles. His marriage ended in divorce. His wife moved back to the States. So he lives alone, in Berlin, far away from the young man that he brought into the world and that’s heartbreaking for him. I think that’s a great reflection of what many people who work for the CIA go through, the price that they have to pay for the job that they have to do. What do you think it is about him as a person, that keeps him from being station chief and achieving those higher levels in the organization? I don’t think he has aspirations to work on that level. I think he knows where he’s good, where he’s efficient, and where he’s needed. He doesn’t want the corner office. He’s not a party guy. He’s not a cocktail fellow. He’s a work horse. He’s as happy in the trenches as he is anywhere else. He’s happier in the trenches than anywhere else, I should say. He definitely seems like a team player. Absolutely. The team is the first priority in his life, even at the expense of his own personal life. In season one, you got the quintessential spy movie scene with the epic car chase. You know that was directed and choreographed by a stunt team from Paris and they worked on the Bourne movies and the Taken movies, I was lucky to be a part of the Taken movies. We do have car chases this season and I am in the big one. I’m in a different seat this year, though. I’m riding shotgun. The driver is Keke Palmer, our other new cast member. She is just terrific and our characters have a real good relationship and a really good time together on and off screen. Bringing in Keke and Ashley this season and re-booting the story in a different direction, did it reinvigorate everyone that this is a totally standalone season, even through connected to the first? Correct. They happen to be women. Strong women, vocal women. Women who don’t compromise. But we could take the “woman” out of that sentence and say they are people who represent all of those characteristics. Both of them are outstanding at their jobs as actors. Both of them live their lives so fully, trying every day to learn, but also to teach. I admire them both. I can’t see the show without them. It feels like they were always there. At the beginning, at least of season 2, Daniel Miller is deep under cover with a radical far right group. This feels like a timely storyline in the US and Germany right now. What were your thoughts when you saw the direction of the story for season 2? I thought it was very risky. The thing is many of the events that have happened in the past year had not unfolded yet. All the elections that have happened and Brexit and then the Northern European countries and the German elections…when this story was pitched to the studio and the network heads, we hadn’t even had our own election. So when we were there filming in real time, things were unfolding across Europe and back home that astonished us. Our writing team, led by Bradford Winters, seemed to be ahead of the curve, ahead of the political news cycle. I was done, finished, shot my final frame of season 2 and home with my family in the Hollywood Hills, when the German Parliamentary election took place. Let me tell you, that election…It wasn’t their aim to depict actual events in current time, the writers’ aim was to be relevant and yes current, but not to depict actual events. When you see this season and how it unfolds, how it comes to a head, it will blow your mind. It’s blown all of our minds. We’ve all been emailing each other since we got back saying, “Can you believe this?” It’s amazing. Having spent so much time in Germany and having a show that’s wrapped up in the identity of that location, do you feel like you’re more invested in what happens in Germany? Are you paying more attention generally? 1000%. I live there six months out of the year now. While we were there, the events that took place in Charlottesville back here at home were happening. And immediately following that, there was the great big, huge Neo-Nazi white supremacist march in Germany, of all places. You would have thought those words, those sentiments, those beliefs could never, ever have happened again. What is amazing about shooting in Berlin, the capital of Germany, the site of such extraordinary history is that the Germans don’t shy away from remembering their history. They memorialize it on practically every corner, every street. The remnants of the Berlin Wall are up all over. You see bullet marks on buildings from WWII, there are memorials to the Holocaust – to the Jews that were killed, to the gypsies that were killed, to the homosexuals that were killed. There are little brass medallions in front of every home, all over the city, where families were taken and put into trains and sent to concentration camps. And those little brass plaques, which translated from German are called “stumbling stones,” they’re like 2″ or 3″ x 3″ – is the name of the occupant, the resident of that house, the day that they were taken, and the day that they were killed. You don’t take that for granted. You see it every day, all over the city. While living in a metropolis that is just blowing up with activity, construction, the arts, the cuisine, the clubs, the music…the city is just blowing up and is in fact the star of our show. Having spent so much time there, what is your favorite thing about Berlin? That’s like saying what’s your favorite thing about New York, or Rome or Paris or London. There’s so much. There’s really something for everybody there. I seem to everyday learn something new about the city. We work with a crew that’s almost predominantly German, and I love them. They all came back from season 1. I love being with them. I love their work ethic. We have such a terrific time together. I love to hear their stories of their Germany and their Berlin and their history. It humanizes what I’ve studied and read in history books as a child. It brings it all to life. For people who may be new to Berlin Station this season, and for those who’ve been on board since the beginning, what do they have to look forward to in season 2? First and foremost, we want to have fun – an enjoyable viewing experience. I think of the series as…I have three paperback spy novels by my bedside right now. One of them is the new John le Carré, I’ve always loved spy novels. I’ve always loved the genre. I like to think of Berlin Station as the modern day take on the old school spy novel. Yes, we deal with current events. Yes, we deal with serious issues. But we are also a good old fashion spy story.